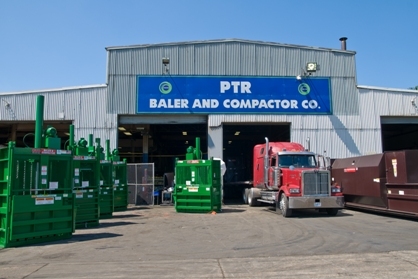 PTR Baler and Compactor Company is widely known for building the highest quality cardboard balers and industrial waste compactors in the industry. At PTR, quality and safety are our core values. We use only the most reliable parts in our products which are built to last for years of trouble-free operation and designed around meeting the most strict safety requirements. Our team of engineers works every day to improve our products and ensure that we build the best balers and compactors in the world. PTR Service operates nationwide, serving our valued customers maintenance and repair needs. Our expert team of professional service technicians are trained to in all makes and models of recycling balers and stationary or self-contained compactors as well as floor care equipment, docks and other back of warehouse equipment. Help is only one phone call away. PTR Parts provides quality OEM parts to other service providers who maintain and repair their own equipment. We understand the need to get you the right part for the job as quickly as possible. Our team of expert parts replacement consultants can help you get the job done. Order online or call us directly and we will make sure you have the job done and the equipment up and running quickly and professionally. We operate in every major metropolitan area from Philadelphia, New York, Boston, Pittsburg, Atlanta, Detroit, Chicago to San Diego, Los Angeles, San Francisco, Dallas or Denver, PTR has equipment, service and parts to meet your needs.